Director Serge Bromberg meets a woman named Inès de Gonzalez in a broken, Parisian elevator. The two get to talking, and Bromberg learns that she is actually the widow of famed French director, Henri-Georges Clouzot. Over the course of their two-hour conversation, Gonzalez reveals that there is over 15 hours of existing footage from Clouzot’s notoriously unfinished film, L’Enfer, or Inferno (or Hell). One imagines a light-bulb flickering on inside Bromberg’s mind just as the elevator rattles back into operation. It’s a scene straight out of a French thriller, maybe even one directed by Clouzot himself, who, 33 years after his death, is widely regarded as one of the great filmmakers of all time—his dark, psychological crime dramas, The Wages of Fear and Diabolique, garnering frequent comparisons to Hitchcock’s finest work. This Friday, July 30th, at the Laemmle Music Hall in Beverly Hills and the Laemmle Sunset 5 in West Hollywood, Henri-Georges Clouzot’s Inferno, a semi-documentary directed by Serge Bromberg and Ruxandra Medrea, will make its Los Angeles premiere. Columbia Pictures, fresh off the relative success of Stanley Kubrick’s artsy (and blank-check budgeted) satire, Dr. Strangelove, decides to invest in another high-minded flick, this time from a commercially viable French director. Amazingly, they hand over a basically unlimited budget to one Henri-Georges Clouzot, who, despite considerable success from both critics and audiences, had been receiving harsh backlash from those rascally kids of the French New Wave. Clouzot, in turn, was eager to prove his worth. He set about devising a dark, surrealistic psycho-drama—with embedded allusions to Proust and Dante’s The Divine Comedy—about a husband’s extreme jealousy over his seductive wife. 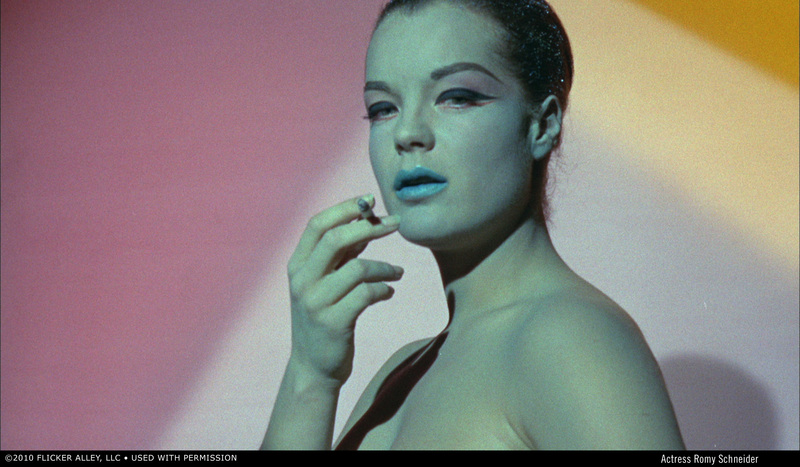 International film star Romy Schneider was cast as the leading lady, and Serge Reggiani was to play her brooding husband. But only a couple weeks into filming— with the increasingly temperamental Clouzot employing three separate crews and over 150 technicians—Reggiani dropped out, the location of the set suffered a record-breaking heat wave, and an artificial lake (essential to the production) was forced to be drained by French authorities. At last, the entire film was shut down when Clouzot was hospitalized due to a near-fatal heart attack. Such stories of the genius, maniacal film-director making their doomed masterwork have been told before, and well (The Burden of Dreams, Hearts of Darkness, Lost in La Mancha, Overnight, etc.). 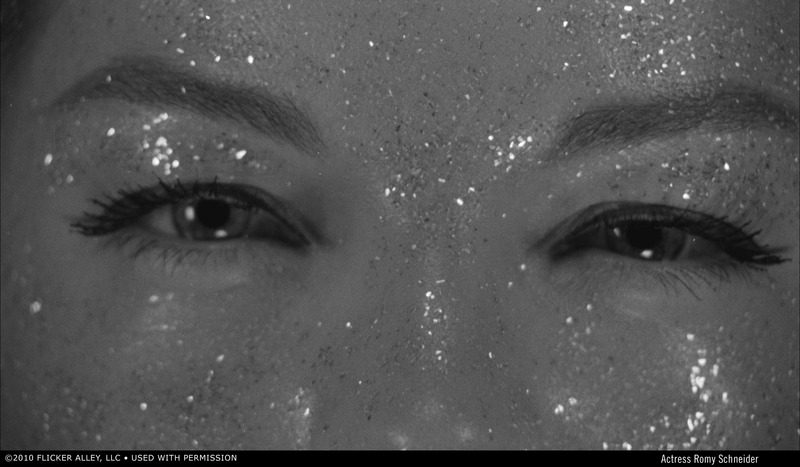 But what Bromberg’s movie brings fresh are simply the brilliant—though limited—images from Clouzot’s failed venture. Part black-and-white, part color, the fractured scenes are so stunning and highly experimental for their time, it’s a wonder (and a relief) it was filmed before the advent of digital technology. It’s a tragic fact that Clouzot never returned to complete L’ Enfer after his recovery, but there’s beauty to be had in the unfinished, the what-could-have-been. After all, if that elevator had not broken down, if it had completed its intended journey on that fated Parisian day when Serge Bromberg met Inès de Gonzalez, there would be no Henri-Georges Inferno—those hours upon hours of gorgeous footage left to rot in some sterile vault—and more importantly, we would be left with one less choice of what to see this weekend at the movies. Henri-Georges Inferno opens on Friday, July 30th at the Laemmle Music Hall and the Laemmle Sunet 5. For more information, please visit www.clouzotsinferno.com, or www.flickeralley.com. A DVD release of the film is Janurary 2011 through Flicker Alley, LLC.